Starting with the off-road world, all Nokian R-Truck tyres have open pattern and wide grooves that ensure good self-cleaning on soft surfaces such as mud, sand and snow. This improves both grip and reliability. They feature a special rubber compound that is highly resistant to cuts and cracks, which reduces the risk of tyre damage on rough surfaces. The tyres also have stone ejectors in their main grooves, increasing their operating life. On-road, the Nokian R-Truck tyres boast an excellent mileage thanks to their even wear pattern and low heat build-up.The non-directional pattern is also quiet and has a low rolling resistance. The new Nokian R-Truck series is suitable for year-round use. All have 3PMSF approval, and they are equally at home on snowy roads and hot tarmac. Designed for year-round use on steer axles for on and off-road trucks. The stone ejectors in its main grooves prolong the operating life especially on rough surfaces. 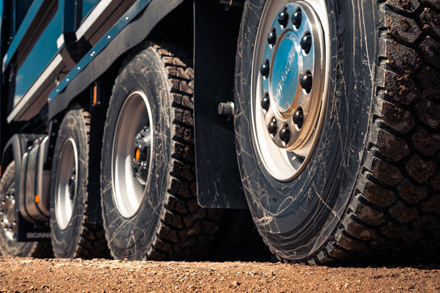 An all-season drive axle tyre designed for on and off-road trucks operating in demanding conditions and various surfaces. Its tread has large blocks that offer durability and reduce cuts and tears in challenging environments. A reliable choice for demanding year-round trailer use, Nokian R-Truck Trailer is optimized for demanding on and off-road and timber trailer use. Its main grooves have stone ejectors that reduce the risk of tyre damage.